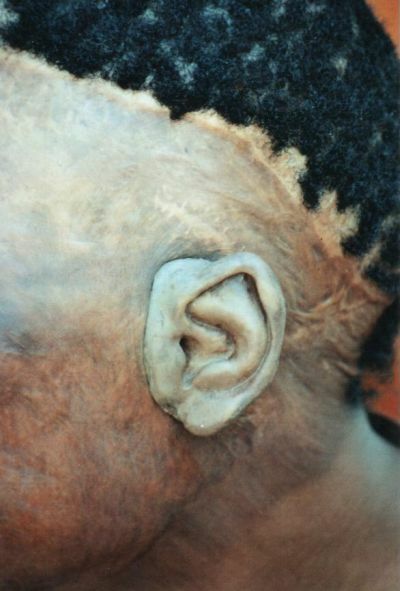 Bongani has a prosthetic ear. These slides show part of the planning process that involved Bob Quin of the CSIR, Jo�burg Gen Radiology Department, Bloemfontein�s Central University of Technology, Wits University�s Dr Joseph Schmaman and Prof Dale Howes and his colleague Carol Voigt. 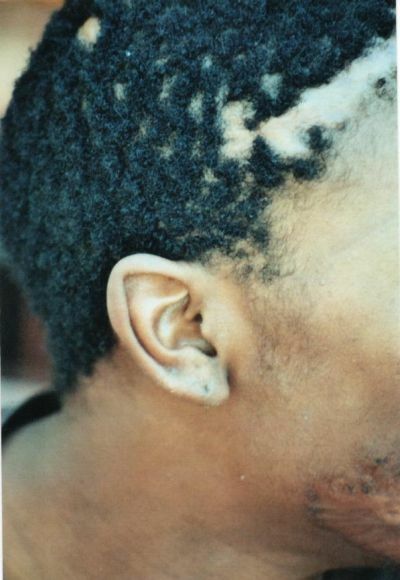 Bongani Madlala had two tissue expanders inserted into his scalp in February 2010. A month later one expander extruded through his scalp. 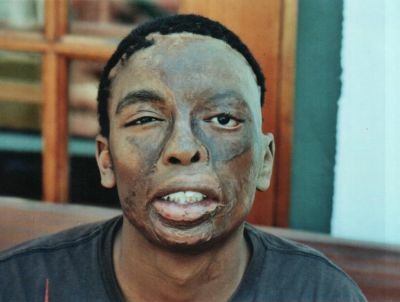 A week after the extrusion, he received surgery at Charlotte Maxeke Hospital. 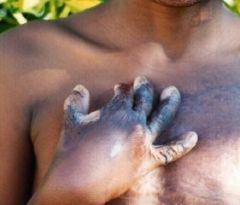 The delay in the emergency procedure meant that Bongani could not see his mother and grandmother for Easter 2010, and will have to wait another three lonesome months before seeing them again. For a boy who really loves his family and the countryside, that's hard. Bongani Madlala is looking forward to a new ear for Christmas 2008 or early in the New Year 2009. 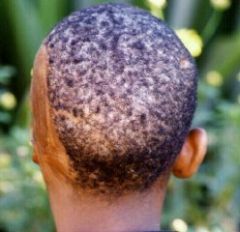 A large team of people from Pretoria, Bloemfontein, Johannesburg and Sandton have co-operated in each facet of making a beautiful new rather-expensive ear for him that will be firmly fixed to his head. Thanks to everyone who played their part. The full history will be covered in a future newsletter and might also appear in Drum magazine in December 2008. 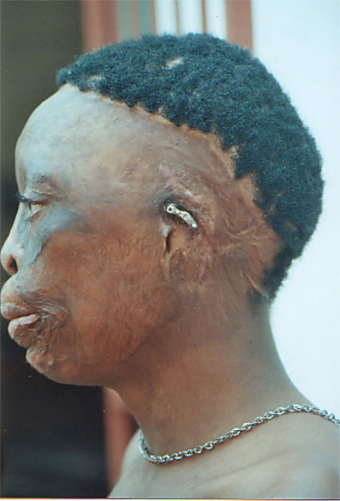 Bongani holds the rapid prototype of his existing ear, to be used to make a mirror image for his missing ear. The rapid prototype was made by Ludrick Barnard and colleagues in Bloemfontein at the Central University of Technology, after the CSIR in Pretoria refused to assist. 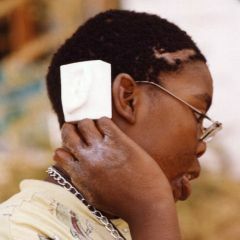 Bongani with rapid prototype ear to be used to make prosthetic ear. 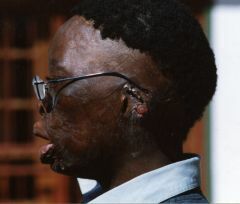 2007 will see Bongani with his best replacement ear to date, as maxillofacial surgeons, radiologists, prosthetists and rapid prototyping specialists all combine their skills to make him a perfect mirror image of his existing ear and then join the prosthesis to his head so that, unlike the last two, it cannot be knocked off by a violent father and it cannot go flying through the forest to be lost amid the leaves, when playing vigorously with friends! 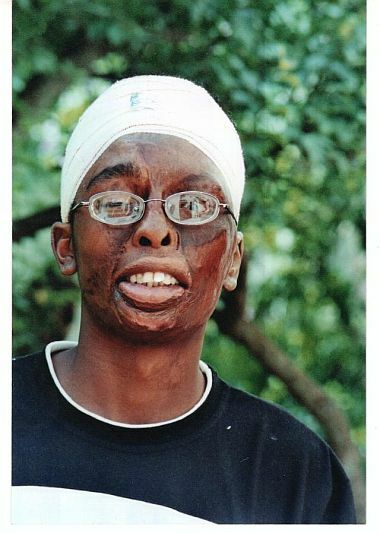 Bongani Madlala was operated on at Johannesburg General Hospital on March 3rd 2004 by Prof. John Lownie in the maxillofacial unit. 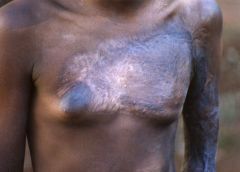 The implants that were placed in his skull in early August 2003 were exposed. 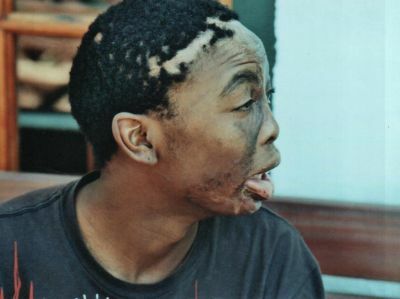 On March 18th 2004 the prosthetic ear was placed on his head. 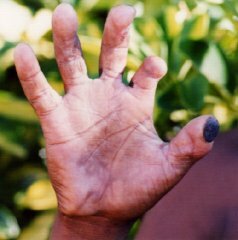 Before work on his head, we had to carry out extensive dermatological treatment for a fungal infection. 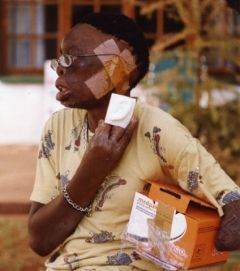 In around June 2003 he also had a tissue expander inserted (after and it was inflated during July, August, September, October) and on 27th November it was removed. 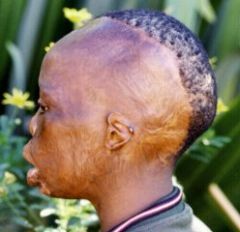 Part of the inflation was carried out by plastic surgeon Jan Kleynhans in Pietermaritzburg but the rapid expansion was not the appropriate treatment for Bongani's head. 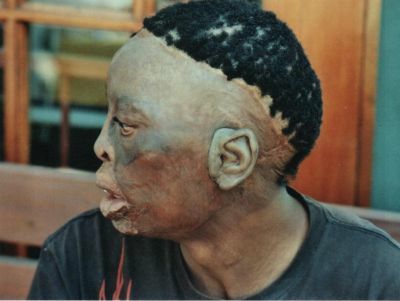 Bongani has also been taken to a variety of eye specialists. He had some glasses made and managed to lose them as well! At long last he has seen a really good eye specialist and will hopefully have new glasses that really assist his vision, by early April 2004. Thanks to Marthie Els of Stanley & de Kock Optometerists in Auckland Park; Dr Chris van Niekerk, eye specialist Netcare Rehabilitation, Auckland Park and Marietjie Richeter of Rand Afrikaans University Optometry Department. Dr van Niekerk said that while Bongani had developed a lot of compensating behaviour, he was legally classifiable as blind. We hope that once he has glasses with an appropriate prescription, that Bongani will at last be able to catch up educationally and learn to read properly. He is not stupid; he simply cannot see. 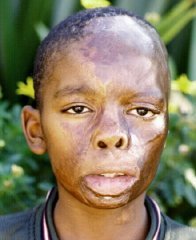 Bongani Innocent Madlala, born February 18th 1993, lives with his 47 year old mother Annie Manosi Sikakane in Howick, KwaZulu Natal. 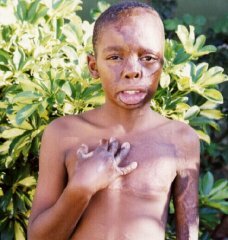 The little boy aged ten years old, came to stay with Children of Fire in Auckland Park in March 2003. 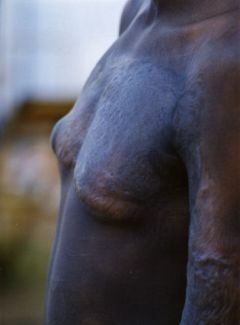 He lost most of an arm and an ear, due to severe burns at the age of three months. 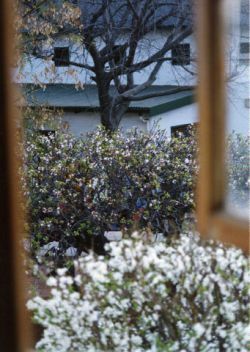 The family were living at Impendle at the time and a candle fell from a table on to his bed setting the pillow and his bedclothes alight, around May/June of 1993. Because of his young age there are no photographs taken of him before the accident. He is in Grade 4 at Cosmo Primary School, Howick West (tel 033-330-3744). The principal Mr. Singh was interested and pleased to learn why Bongani was going to Gauteng Province. He said that Bongani is treated as a perfectly normal member of the school and takes part in everything, including sport. Annie proudly told me that he took part in a race at Midmar on March 21st 2003 and finished No. 4 and now has a medal to show for it! The house is in Kwa Mevana township on the edge of the town of Howick. It was originally built for the workers for the Sarmcol Rubber Factory. It is brick built with four rooms (two bedrooms) and has a rudimentary electricity supply. Annie's various employers often buy her R10 tokens for the pre-paid meter. 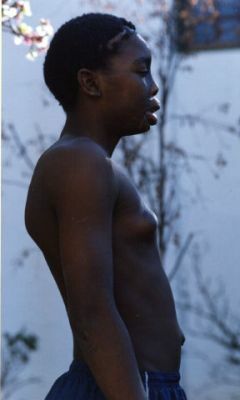 Bongani has three brothers aged 20, 18, and 7. His father, who is unemployed, seems to be very little involved in the family and Annie appears to be the sole breadwinner, working in gardens for five days a week for three different families. Annie's father-in-law died in 2002 but his wife is still alive so there is a granny and an auntie living in the house plus all Annie's family. Bongani's eldest brother Lucky (20) has been ill, spent some time in Edenvale Hospital recently and has to go to Wentworth Hospital in Durban at end March for an operation for what appears to be a heart problem. 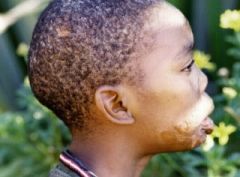 Bongani was brought to our attention after Yvonne Spain, who works with another children's charity CINDI, spoke to Howick Rotary about Children of Fire bringing a maxillofacial prosthetist over to South Africa. A Rotarian, Trish Taylor, remembered the child because his mother works for her. While arrangements were not concluded in time to meet that specialist, the charity is exploring all possible options to optimise Bongani's quality of life. Also all the children who come to visit, enjoy a break away from home in a place equiped with lots of playthings and new experiences, so his time in Auckland Park will be happy. Transport to Johannesburg was arranged with Moray Hawthorne, a partner at the legal firm Webber Wentzel Bowens which is assisting the charity in its endeavours to empower squatter camp communities.